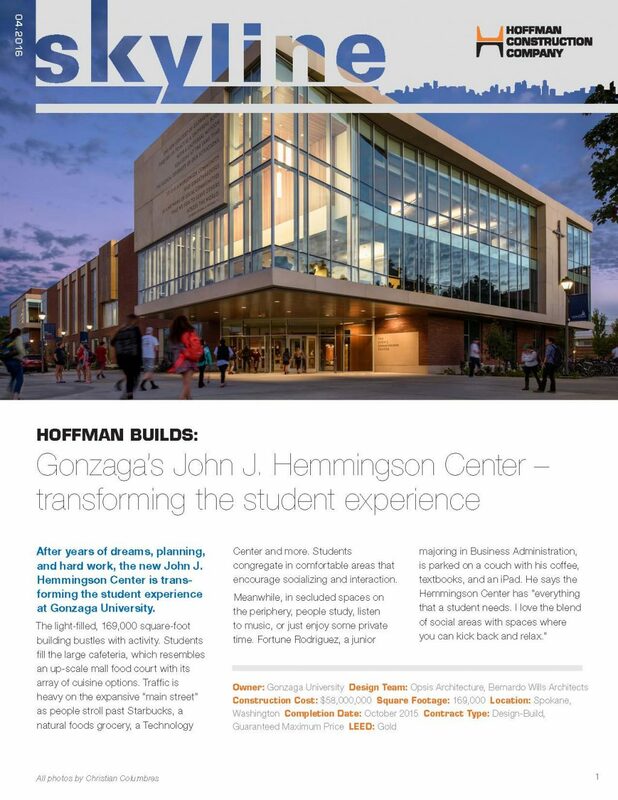 After years of dreams, planning, and hard work, the new John J. Hemmingson Center is transforming the student experience at Gonzaga University. The light-filled, 169,000 square-foot building bustles with activity. Students fill the large cafeteria, which resembles an up-scale mall food court with its array of cuisine options. Traffic is heavy on the expansive “main street” as people stroll past Starbucks, a natural foods grocery, a Technology Center and more. Students congregate in comfortable areas that encourage socializing and interaction. Meanwhile, in secluded spaces on the periphery, people study, listen to music, or just enjoy some private time. The design-build team of Hoffman, Opsis Architecture, and Bernardo Wills Architects (BWA) was no stranger to challenging higher education projects. Key members of Hoffman and Opsis were coming off a new Performing Arts Center for Reed College in Portland, Oregon, where their collaborative process delivered a multi-program building within a sensitive budget. The Gonzaga project had some ambitious goals. Beyond a modern student center and campus gathering place, the University wanted a home for program elements ranging from the University Ministry and Center for Global Engagement, to student development programs such as Involvement & Leadership, Community Action and Service Learning, and Multicultural Education. The school set a high bar for sustainability, and established an aggressive schedule of just 22 months from groundbreaking to substantial completion. The site, situated on a main east/ west axis of the campus, challenged Hoffman to maintain safe pedestrian and vehicle flow and avoid impact to the adjacent library, residence halls, recreation center, and retail complex.